1) Attended the Chula Vista Genealogical Society and ChulaVista Public Library Family History Day on Saturday, 20 September. There were a number of stations manned by CVGS volunteers (family trees, online searches, children's activities, Ancestors Matter display, genealogy books, genealogy help, etc. ), plus the FamilySearch Library volunteers who brought computers hooked to FamilySearch. We had 150 to 200 attendees from the community for this FREE walk-in event. 2) I presented my "Overview of Autosomal DNA Testing and Analysis" as the Keynote address for Family History Day at 10:30 in the library auditorium. In this presentation, I discussed the basic science, the testing company features, and details of finding ethnicity estimates and DNA matches, plus how to manipulate the data in tables and spreadsheets, using my own results as examples. 3) I also presented "This is Your Ancestry, Greg Cox" to current longtime County Supervisor Greg Cox and his family, in addition to other attendees. I've worked the last eight months on this project with the help of Greg and his daughter, and they seemed to enjoy it and be impressed by the results. 4) Continued to work on the Greg Cox RootsMagic family tree during the week, which now has 548 persons with 1,838 citations (down from last week because I deleted non-family entries). 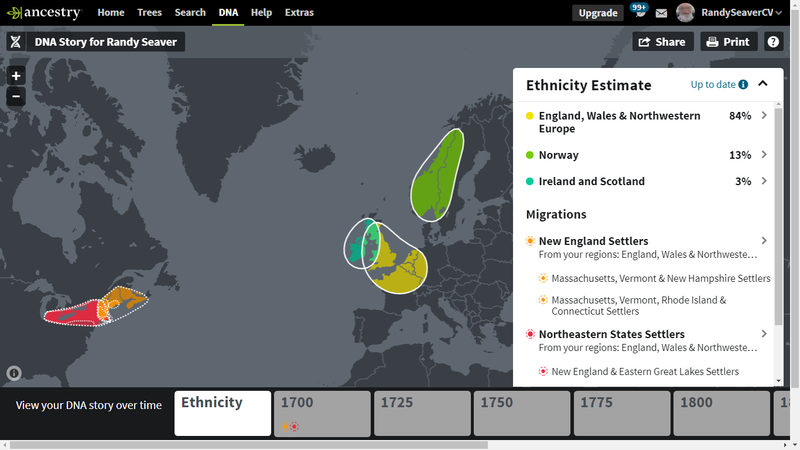 I TreeShared it twice, and resolved all of the Ancestry Hints. I created several reports, and presented a 10-generation ancestors report to Greg Cox at the meeting. I also created PDF albums of the four different grandparent's lines of the record images with captions. These, along with the family tree GEDCOM file, will be passed to the family soon using Dropbox. 5) Searched for and found more land records for several Zachariah Hildreths in Townsend, Mass. on FamilySearch. Transcribed one of them in Amanuensis Monday - 1809 Deed of Zachariah Hildreth to Zachariah Hildreth Jr. in Townsend, Mass. today. 6) Participated in today's Mondays With Myrt webinar, and discussed the CVGS Family History Day activities and my two presentations. We also discussed backing up our files, using Evernote and OneNote, the FindAGrave/PeopleLegacy issue, Pat Kuhn's YouTube videos, the WikiTree source-a-thon, the Kelowna BC conference, and the upcoming Pirates of the Pedigree conference. 7) Watched the Lost Children: Orphans, Vagrants, Delinquents, Half-Orphans, Dependents, Surrendered, Adopted webinar by Jeanne Bloom on Family Tree Webinars. 8) There were several sessions working in RootsMagic to update FamilySearch Family Tree profiles for Seaver families and other database families, with occasional additions to the RootsMagic profiles. I have matched 26,281 of my persons with FSFT. I continue to use Web Hints from Ancestry, MyHeritage, Findmypast and FamilySearch to add content and sources to my RootsMagic profiles. I now have 50,874 persons in my RootsMagic file, and 96,212 source citations. I TreeShared twice during the last week, and resolved over 800 Ancestry Hints. I've fallen behind on the Ancestry Record Hints with 77,852 waiting to be resolved, but I work on them occasionally. 9) Have 308 Shared Ancestors on my AncestryDNA list (I had 307 last week), 993 4th cousins or closer (I had 983 last week), and 901 pages (over 45,000 matches with at least 6 cM) (was 895 pages last week) of matches. I have 23 DNA Circles (was 23 last week). I have 16 matches that are third cousins or closer (was 16 last week), and 103 matches with 34 cM (0.5%) or more (was 103 last week). My highest match has 779 cM (11.5%), and is one of my first cousins. Added more notes to my DNA matches. 10) Have 4,682 DNA Matches on MyHeritage (up from 4,609 last week) with at least 8 cM (0.12%), with 28 matches with more than 34 cM (0.5%) or more (was 28 last week). I have three close relatives, including a first cousin once removed, and two first cousins twice removed. The highest DNA match is 512 cM (7.1%). 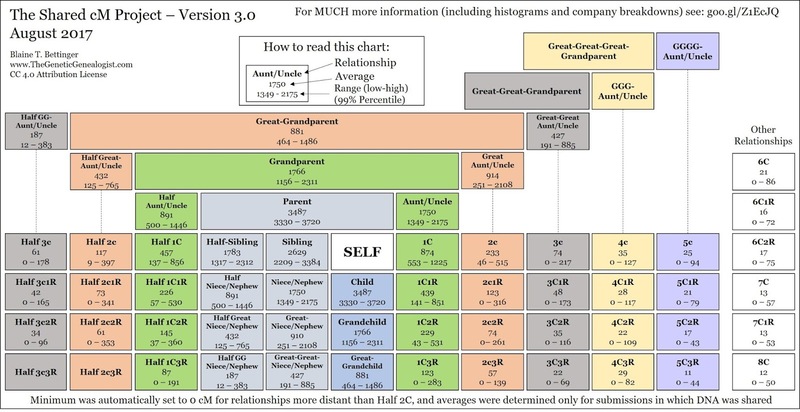 11) Have 990 DNA Relatives on 23andMe (I had 989 last week) who share at least 0.10% (7 cM) with me. The two closest relatives are third cousins. Of these, only 3 share 1.0% or more, and 49 share 0.50% or more (was 49 last week), with the highest match being 1.54%. My highest match is an adoptee. I struggle to find out anything about most of these testers. 12) Have 2,809 autosomal DNA Matches on FamilyTreeDNA (up from 2,795 last week) who share 0.25% (18 cM) or more, with the highest match being 96 cM (1.42%). I have 12 who share at least 1.0% (68 cM) with me, and 1,511 who share at least 0.50% (34 cM) or more (was 1,506 last week) with me. 13) Wrote 17 Genea-Musings blog posts last week, of which one was a press release. The most popular post last week was "PeopleLegacy.com Blatantly Copies Most of the FindAGrave.com Content" with over 733 views.